Hononegah’s early life seems to be a mystery. According to some sources, she was born in 1808. Some claim she was a daughter to the chief, making her a Native American princess while others say that she was an orphan being raised by her three uncles. Whether princess or orphan, Hononegah’s story is filled with adventure and heart break. 15 year old Hononegah, according to one newspaper account from 1929, met Stephen Mack while she accompanied her father (or uncle) to search for a higher hunting ground for her village. 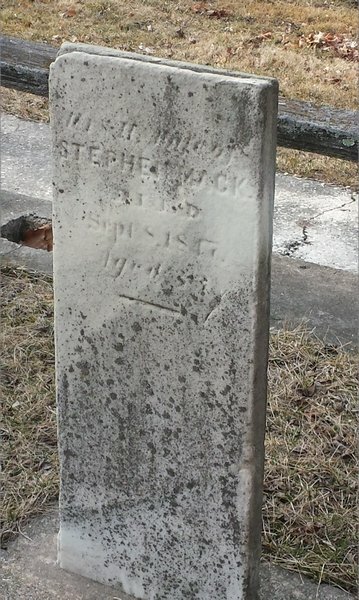 While on this scouting trip they stumbled onto Stephen Mack who was suffering from a high fever and near death. Hononegah was very skilled in the medicinal plants and was able to nurse the young man back to health before continuing on her journey. Mack was so touched by her beauty and gentleness that as soon as he was able to travel, he began to search for Hononegah. Mack found Hononegah living in the area of Grand Detour. Mack decided to stay and trade with the Potawatomi Tribe that called that area home. Mack would trade their furs for supplies. He made frequent trips all the way to Chicago on his pony to sell the furs and replenish the supplies he sold. The arrangement worked to everyone’s benefit for awhile but the Native Americans wanted Mack to supply them with liquor and firearms. Mack refused and some of the men decided to kill Mack when he returned from his trip to Chicago. Hononegah overheard the men’s plans so she bravely sneaked from the camp and met Mack before he could be attacked. Mack and Hononegah left the area for safer lodging. One thing that remains clear in all the murky tales of Hononegah’s past is the courage that Hononegah always displayed. Whether it was protecting Mack from certain death or treating neighbors through their illnesses, she never hesitated to help. Stephen Mack would eventually become the first white settler in Winnebago County when he opened a trading post and started his own village where the Pecatonica and Rock Rivers converge. Hononegah continued to utilize her knowledge of medicinal plants and nursed her neighbors. Everyone who knew her spoke of her gentleness and willingness to help. Mack eventually built a beautiful home for her and their eleven children (two died when still infants). Hononegah seemed to enjoy her new home but still held on to her heritage. She continued to dress in the traditional Native American clothing. Disaster struck when Hononegah became sick and passed away in 1847. Mack was completely heartbroken and seemed lost without Hononegah. He was left with nine children aged from four months to 15 years old. It might have been desperation that caused him to marry a widow, Mrs. Isabella Daniels. Though they did not share details, Mack’s friends claimed this marriage was a mistake right from the very beginning. The tragedy of Honoengah’s death was compounded when one of Stephen’s beloved children, nine year old Henry Clay, died in 1849. Then the unthinkable happened and Mack died, or as some hinted, was helped on to his death in 1850. Now orphans, the Mack children were split up and sent to live with different relatives. Hononegah and Mack’s story is kept alive at the Macktown Living History Education Center at the Macktown Forest Preserve. Their home still stands as well as the Trading Post that Mack built.